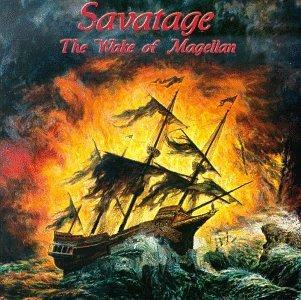 Savatage - "The Wake Of Magellan"
Savatage released their eleventh of twelve studio albums, “The Wake Of Magellan” in 1997. Like most of its predecessors it is a concept album typical for the band which impresses not only with a catchy and socially criticising story, but also with its musical performance. Savatage has slipped many classical and progressive elements in, which gives this album its very popular Rock Opera sound. This classic will now be released as a digipak including the original booklet. As an extra this album will contain two bonus tracks as well as an exclusive and personal quote of Jon Oliva he especially wrote for this edition. earMUSIC is going to release the whole back catalogue of Savatage within this year and will bring a mile stone of metal back to the fans! As a very special bonus all the 14 albums aligned in a row result in the Savatage logo on the side. A must have in every CD shelf. The back catalogue of the metal legend SAVATAGE has approached the next round – Savatage is back! with an exclusive, new shaped design including extensive liner notes and anecdotes by Jon Oliva himself. Furthermore, every reissue contains selected unreleased bonus tracks, some of which were previously unreleased. With "Power Of The Night" and "Gutter Ballet", two more albums out of SAVATAGE's line of re-issues are on the market now. Each of both albums appears as a digipak with a new shaped design and liner notes by Jon Oliva. The release of the renewed back catalogue of the metal legend SAVATAGE is going to the next round with the release of the combination of the debut „Sirens“ (1983) and the mini album „The Dungeons Are Calling“ (1984). This record is complete new mastered and merges to a new entity with the personal quotations of mastermind Jon Oliva. It will be released in a well-crafted digipack and will impress with a bonus track: an acoustic version of “In The Dream” which was recorded in 2010 by Jon Oliva.